My Auntie Sonia used to make a seven-layered custard cake. When I tried to recreate it, it involved a ton of work and many layers of a biscuit. This version is much lighter and takes half the time, whilst being just as delicious. Preheat oven to 170°C. Prepare 2 x 24cm layer tins. Beat the egg yolks very well, and then gradually add the water. Add the sugar gradually, beating well until light and fluffy. Then add the dry ingredients. Beat the egg whites until soft peaks form and then fold into the yolk mixture. Pour mixture into prepared tins. Bake for 25 minutes or until golden. When cool, cut each layer horizontally in half. Beat eggs, sugar, flour and vanilla until thick. Heat the milk and add the egg mixture to the hot milk. Whisk over double boiler until thickened. When thick add the custard powder, and whisk until custard thickens even more. Set aside to cool with a piece of wax paper on top to prevent a crust forming on the custard. Spread custard in between layers of the cake, stacking them on top of each other. 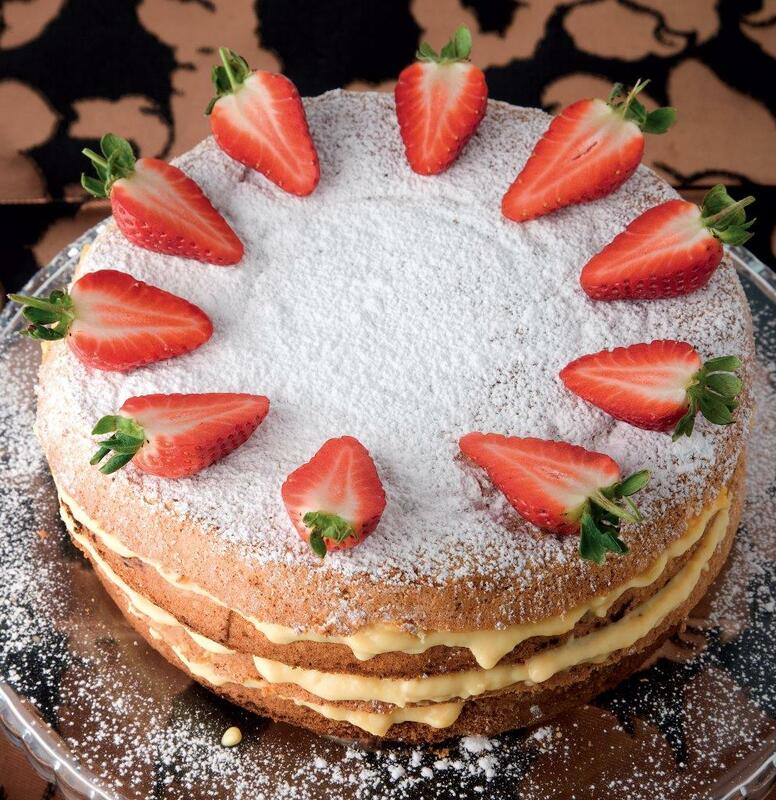 Complete with a layer of custard on top and decorate with strawberries or raspberries. CHEF’S TIP: This cake can be frozen without the filling. Defrost and then fill with custard as desired.